Serve steaming cups of coffee, tea, and hot chocolate in this Choice 12 oz. ivory (American White) Victor china coffee mug. 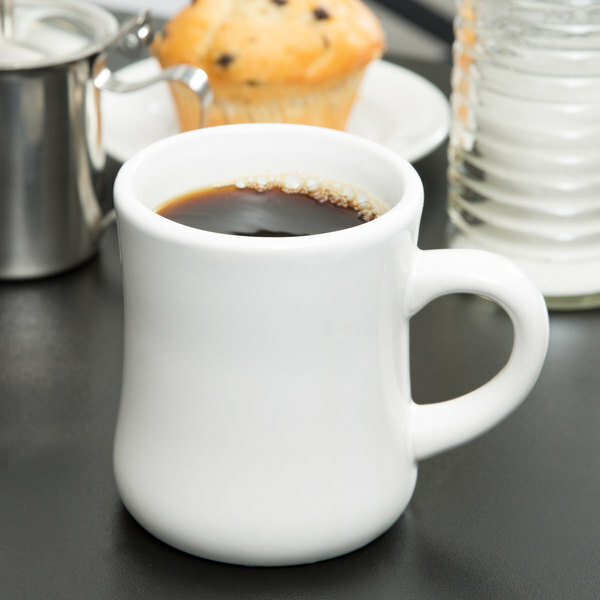 Great for a variety of beverages, this mug provides simple style and function at your cafe, diner, or breakfast buffet. With its classic design and durability, you can serve each drink with confidence to keep your guests coming back time and time again! "Nice heavy duty classic coffee mug. I love these much better then the plastic. Great product at an excellent price. They are holding up nicely under every day use." 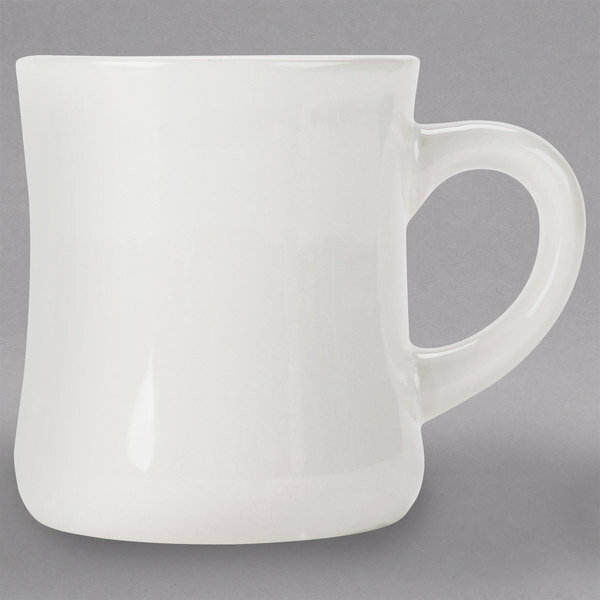 With its ivory coloring, this mug enhances any style or color of table linens, dinnerware accessories, or table settings. The elegant color also provides a touch of sophistication to your establishment. 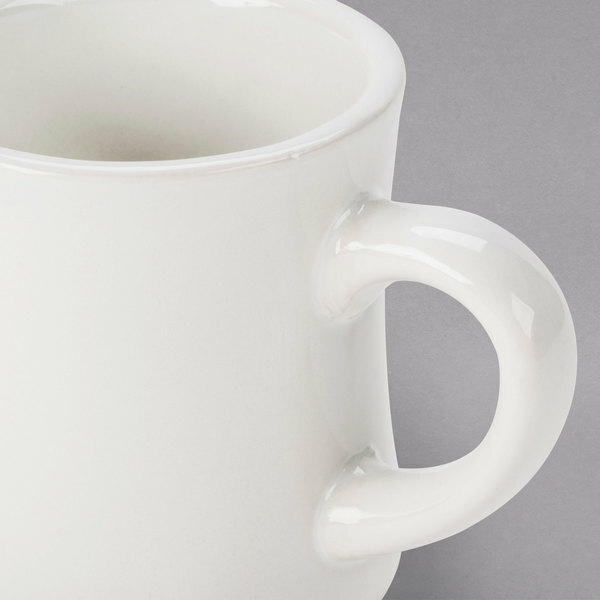 Handled mugs provide a comfortable grip and help protect customers' hands from coming into contact with the the body of the mug, which tends to be the hottest part. A round, sturdy base provides allows this mug to balance on tables, countertops, and trays to prevent spills. Great cups for the price! I calculated how many disposable coffee cups ours company was using and we were shocked to say the least. We switched to these lovely, heavy duty coffee mugs and haven't looked back. They give a nostalgic feel as I reminisce of diner breakfasts with my grandfather, while helping my company create less waste for our future. I will purchase more in the future as our office expands, thank you Webstaurant for providing a quality and accessible product. Mine arrived with 4 dead (see pic). The survivors are light and will not survive bumping. These are not the heavy, diner-type of mugs I was lead to believe they are. CS promptly and without question refunded me for the loss and tried to help me find a replacement. Will try again. Thank you for your feedback! We are sorry your Choice 12 oz. Ivory (American White) Victor China Coffee Mug - 12/Pack arrived damaged. Corrective action has been taken and a Customer Solutions Representative will remain in contact with you about this. 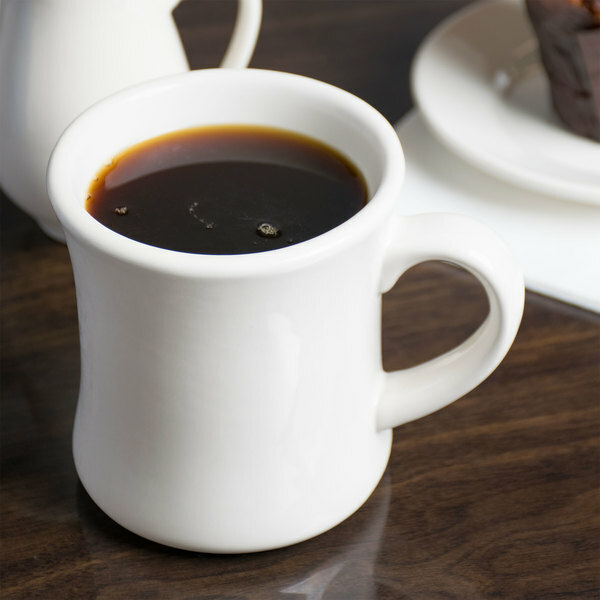 A great style mug from Choice that is well made and works great for coffee or hot cocoa. The 12 ounce size is excellent and the mug reminds me of the diner ones. Wow! Hit this one out of the park!!! Got twelve 12 oz mugs just as described at a very low price. Shipping time two days!!! Super great packaging! Double packed and bubble wrapped. Mugs in perfect condition. This business rocks and has got me locked in! Way to go Webstaurant!!!!! Thank you for your feedback! We are sorry your Choice 12 oz. Ivory (American White) Victor China Coffee Mug - 36/Case was defective. Corrective action has been taken and a Customer Solutions Representative will remain in contact with you about this. Great mugs, our students love them, and they hold up really well to high volume usage. We will buy more of these in the future. I love these ivory mugs ! 12 oz to hold a bigger cup Of coffee or tea and super sturdy. They are thick so you don’t feel the heat. Easy to clean dishwasher safe ! These cups are great, they are very strong and hold up very nice. I would deffinitly get them again. Thanks webstaurant you guys have great products. A nice 12 ounce coffee mug that is similar in design to that off a diner mug. The mugs are great for coffee and are really nice to hold. A great design and price. 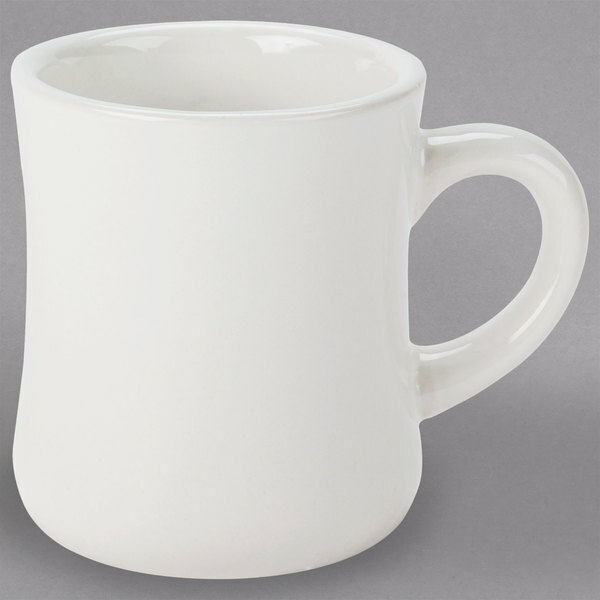 Nice simple mug that looks great on the table! They are a cream white so they are easy on the eyes in the morning. They hold just the right amount of coffee to satisfy the customer while maintaining costs. They are dishwasher safe and durable. These are great mugs. They are a heavy duty and are vey strong, and also a pleasant shape and feel. We have actually has customers ask if they were for sale. These mugs look great. Very white. Light and easy to clean. You can not beat the price on them either. Good for coffee or tea. Great for Coffee or Hot tea, My customers enjoy them. They are bigger than expected but very nice cups. I will be ordering more in the near future. 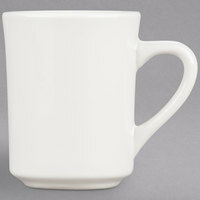 These Choice 11oz Ivory (American White) Victor China Coffee Mug- 36/case was a great purchase. It saves from having to refill coffee compared to smaller mugs. They look great. bought these to replace old mugs. much better quality and holds the heat better while giving the guest a better value due to the size and quantity of the coffee. IT IS A CUP WITH A GOOD DESIGN, DURABLE MATERIAL AND GOOD FINISH. FOR USE IN RESTAURANT IS A LITTLE BIG AS THE COFFEE COOLS, FOR MY NEXT PURCHASE I WILL TRY WITH THE 9 OZ. Best mugs i have ever purchased. Theses have a nice and classy design to them, they are thick and nice with a lovely ivory colour to compliment it. The rim of the mug is rounded which makes it easier for drinking. will recommend. Sturdy and heavy enough to be a long lasting mug but have noticed coffee staining evident more so in these cups than others (quick soak in bleach water does get rid of it). Here at our Bistro, we offer house coffee in these cups, they work well for what we do, they are sturdy, hold up well and safe us on the costs of a paper cup when a customer wants a cup of coffee for here. Nice heavy duty classic coffee mug. I love these much better then the plastic. Great product at an excellent price. They are holding up nicely under every day use. I like how they feel, classic mug, thick ceramic. No imprint on bottom just made in China sticker that comes off. Some coffee stains need scrubbing to remove, dishwasher alone didn't get. Cups are no good they crack in the dishwasher. to bad I like the style of the cup. Time to find another cup, to good to be true. Thank you for your review! A Customer Solutions Representative will be in contact shortly. 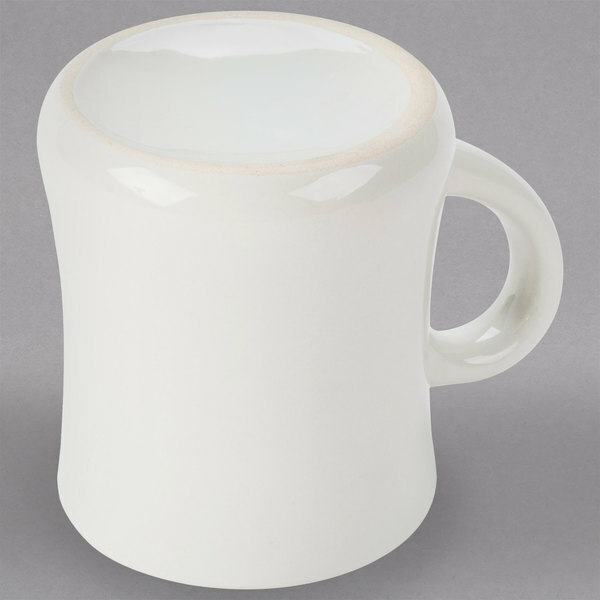 If you are looking for a more durable mug, try the Tuxton BEM-1202 DuraTux eggshell 12 oz. mug instead. Great product at an excellent price. Nicer quality than I had expected, nice size too. We use them in our bakery & they're holding up really well, considering how much use they get! We like the size, shape, etc. But one after another they are breaking / cracking in the dishwasher! I have never had this happen with any other dishes I own. Definitely won't be reordering this product. Thank you for your review! A Customer Solutions representative will be in contact with you shortly. These cups are very sturdy; they have a nice weight; they are comfortable to hold in your hand. The design is classic and our customers like them. Great product. I was very happy with these coffee mugs when I got them. They are a good size for the customers and the price was good for me. Very well made. these are great coffee mugs that have a beautiful design to them. for the price you are getting a great product that can make you wow your guests! Great Cups.Great Price! these cups are 12oz so you dont have to go back for refills so soon and your coffee stays hot. Customers will stay happy. Amazing! These are large and very sturdy. My clients will love them. Best part? I ordered them yesterday (standard shipping) and they arrived today! Thank you! I like this style of coffee mug for a few reasons. For one they are very inexpensive. If you are a place that goes through a lot of mugs than this is a great style for you.